Surrounded by religious leaders, Herbert preached tolerance, diversity. Before Gov. 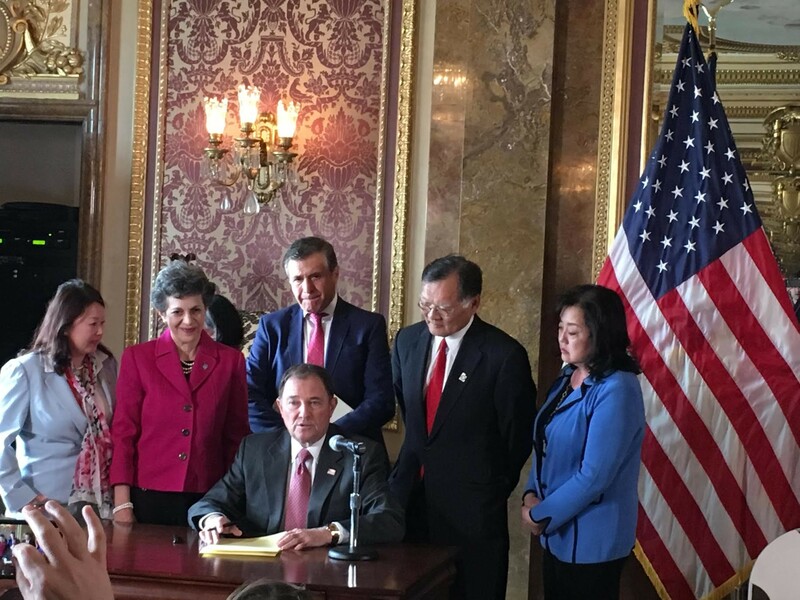 Gary Herbert signed a concurrent resolution on Monday, he said a few words about the need for inclusion and civility. Utah, Herbert noted, a state that was founded by a persecuted religious group, has been enriched by its newcomers. Sen. Brian Shiozawa, R-Salt Lake City, was the primary sponsor for Concurrent Resolution 6, Guarding the Civil Liberties and Freedoms for All American People. Shiozawa’s grandfather immigrated to the U.S. from Japan and settled in Helper to raise his family and work on the railroad. Four of his sons fought in World War II, including one who died in Italy. “The proudest day my grandfather says in his life was the day he became an American citizen,” Shiozawa said. He also noted the political tone surrounding topics such as immigration should be softened. A common mantra for Herbert, he said the country’s goodness—how citizens treat one another—will determine its greatness. Other than to say it’s a scourge on both sides of the aisle, Herbert didn’t direct his political criticism at any specific target—certainly not toward President Donald Trump, who deployed name-calling tactics in the primary and general elections. Indeed, several aspects of the concurrent resolution indirectly speak to policy or practice that Trump opponents abhor. In the wake of Trump’s victory, pundits credit an emboldening of the alt-right—a white nationalist movement that rallied behind the president. This could help explain why Politico, and others, have reported a recent rise in anti-Semitic hate crimes. Utah’s lone Jewish lawmaker, Rep. Patrice Arent, D-Millcreek, who co-sponsored the resolution, pointed out that threats have been made to national and local Jewish community centers. Other minority groups have also been victimized, she added. Trump’s attempted refugee bans were criticized for being anti-Muslim. Herbert, who tepidly supported Trump last fall, said Utah would continue to welcome refugees and immigrants. “That’s to our benefit, by the way, because the contributions of refugees and immigrants that come to our state and what they have given back certainly exceeds what support we have given them,” he said.